Culture Minister Carál Ní Chuilín says she’s due to meet Town Clerk Sharon O’Connor imminently to discuss a bid for the Irish City of Culture title in 2018, a move she says she’ld be fully supportive of. Back in March the Sentinel reported how Dublin was refusing to budge on its position on the Irish title insisting there were no proposals to put the Republic of Ireland City of Culture initiative on an all-island basis. But Ms Ní Chuilín has indicated she is willing to work with Derry City Council to progress a bid. She stated: “I understand that a bid for the Irish City of Culture title has been discussed by Derry City Council and it is the Council’s responsibility to progress this with the Department of Arts, Heritage and Gaeltacht Affairs. “I will shortly be meeting with the Chief Executive of Derry City Council to discuss the matter. My Department’s role is to support and develop cultural product and activity to support a vibrant cultural sector which aims to promote equality and tackle poverty and social exclusion. Earlier this year DUP Alderman Maurice Devenney told the Sentinel a proposed bid to make Londonderry the next Republic of Ireland (ROI) City of Culture was a ‘non-runner’ and that efforts should now be concentrated on securing the UK nomination for the European title in 2023. 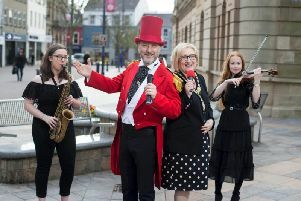 Last October the Sentinel was the first media outlet to reveal Derry City Council was considering a bid for the European Capital of Culture title. In 2023 the United Kingdom and Hungary are the two member states scheduled to nominate Capitals of Culture. Those supporting the respective bids want to use the ROI and Euro titles to build on what was roundly viewed as Londonderry’s successful year as UK City of Culture 2013.